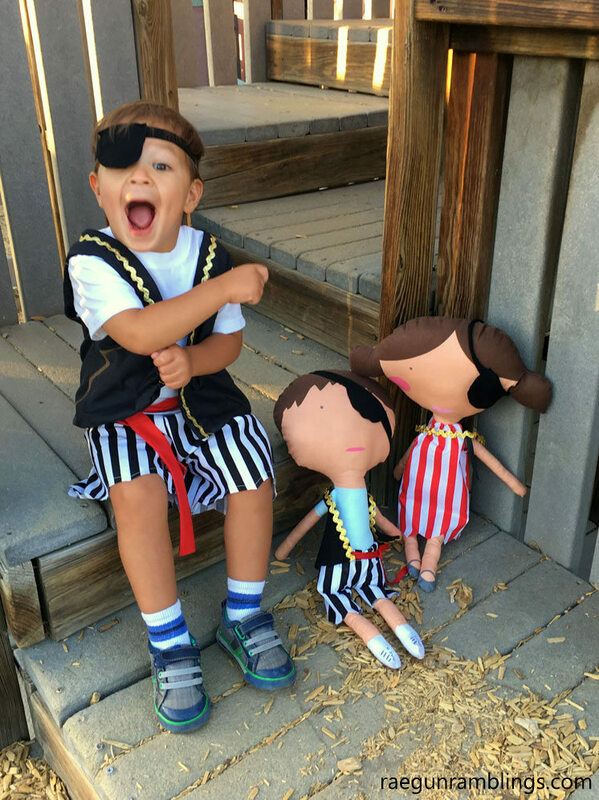 I made the cutest giant dolls this weekend for Teddy and I couldn’t resist but make pirate costumes for them. Today I’m sharing my free pattern! 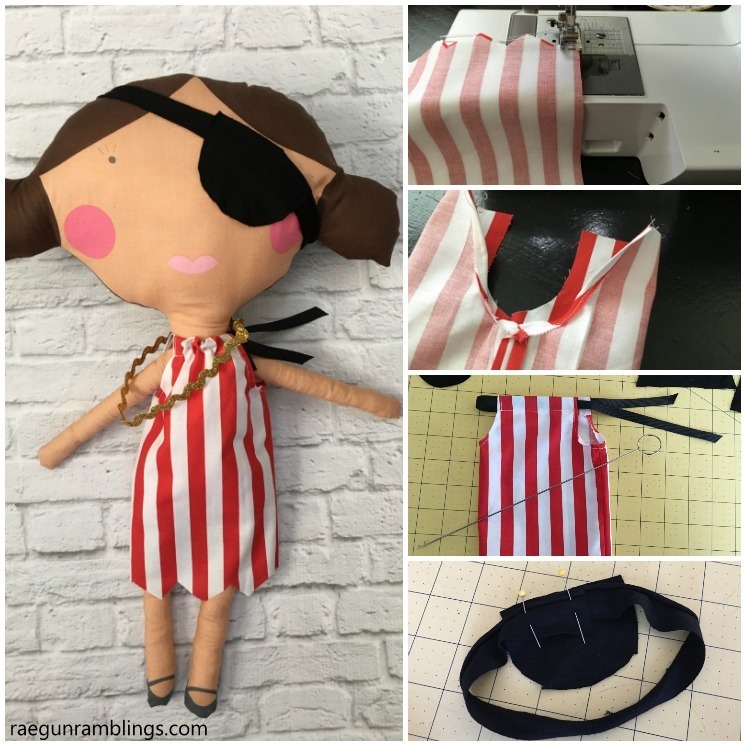 Have you guys seen the Doll Fabric that See Kate Sew has out with Riley Blake Designs? It’s freakishly adorable. It’s a panel fabric which means that all the pieces are printed onto the fabric with cutting lines and instructions. I’m super in love with the fabric. 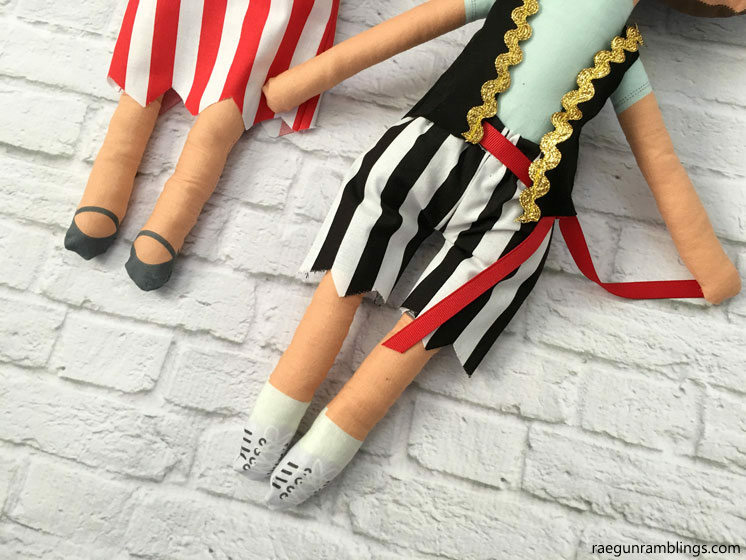 Watch the replay of my Facebook LIVE of me sewing up the boy doll below. 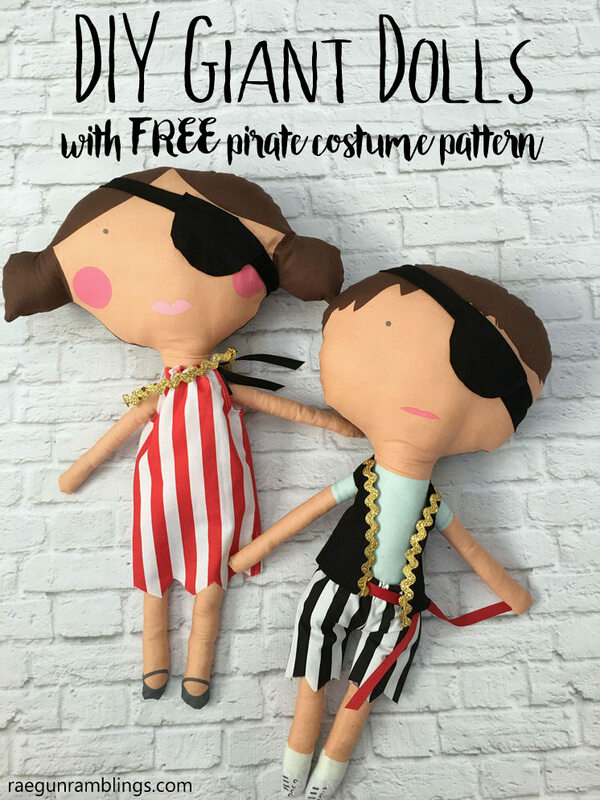 Today I’m hanging out over at the Riley Blake Designs blog sharing the tutorial for how to make both the girl and boy pirate costumes as well as a little coordinating eye patch for your own little pirate (pirate costume available here). The pattern is available as a FREE DOWNLOAD to my newsletter subscribers. You can download the pattern here along with many other free patterns and templates. The password is in every newsletter so if you’re already a subscriber check your last newsletter near the bottom the go to this page to access the patterns. Or if you’re not already a subscriber sign up right here and when you confirm your email it should give you a welcome page with the password for my downloads page. Cut the pattern pieces out. I used woven for the stripes but in retrospect I could have easily used the knit version and wouldn’t have to worry about fraying. But I think the fraying adds to the pirate feel. Note I’m not doing any finishing work since they are doll costume but if you want to finish your seams, edge stitches the pointy edges, press and all that feel free too! With right sides together sew the straight sides of the short pieces together (this will make the center seams). Open up and sew along the curve of the inseam. Iron the top edge under 1/2 inch and sew down to form a casing making sure to leave an opening for the elastic. 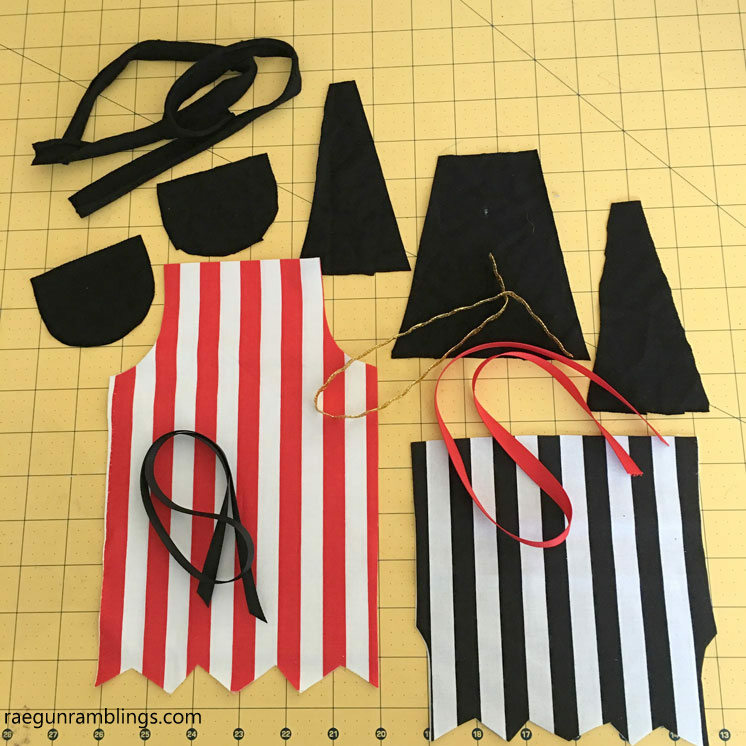 Make the vest by sewing the front vest pieces to the back vest piece at the top edge. Then sew the side seams from the markings making sure to leave holes for the arms. Top stitch the ric rac onto the right side of the vest along the front edge and neck. Now your vest should be done. Cut a length of red ribbon for the sash. Take the eye patch band and form a circle overlapping the edges by 1/2 inch. Pin the eye patch over the overlapping edges and sew in place forming a small box (so that you catch the all edges of the band that touch the eye patch. Now your eye patch is done. Fold the arm holes under 1/4 inch and sew down. Fold the top edges under 1/2 inch and sew down. Thread the black ribbon through the neck casings you have just made. I like to use a loop turner for this. You will tie a bow to close the dress on the doll. Now your dress is done. Tie a double knot of ric rac to make your dolls necklace (alternatively you can sew it into a circle). 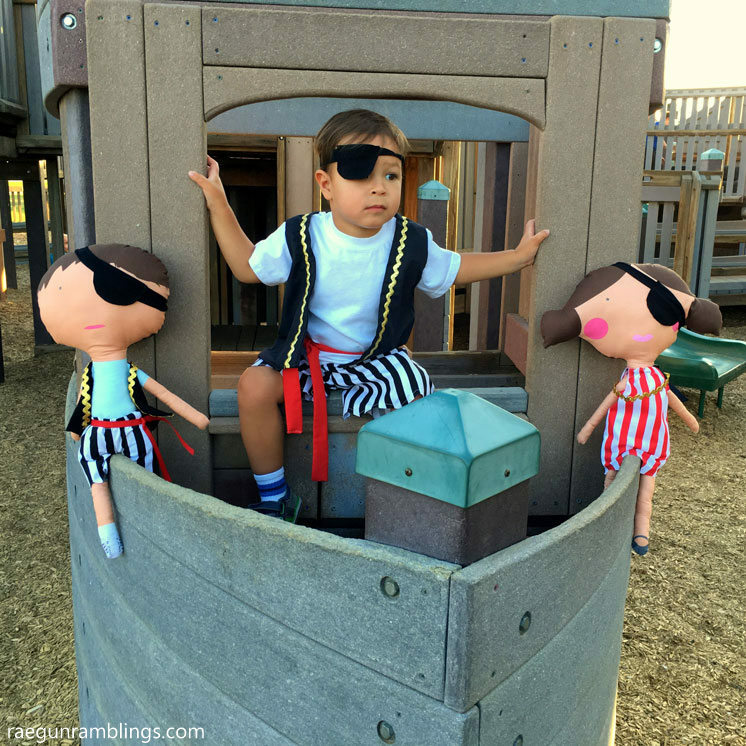 Make an eye patch using steps 9-10 of the Boy Costume instructions above. 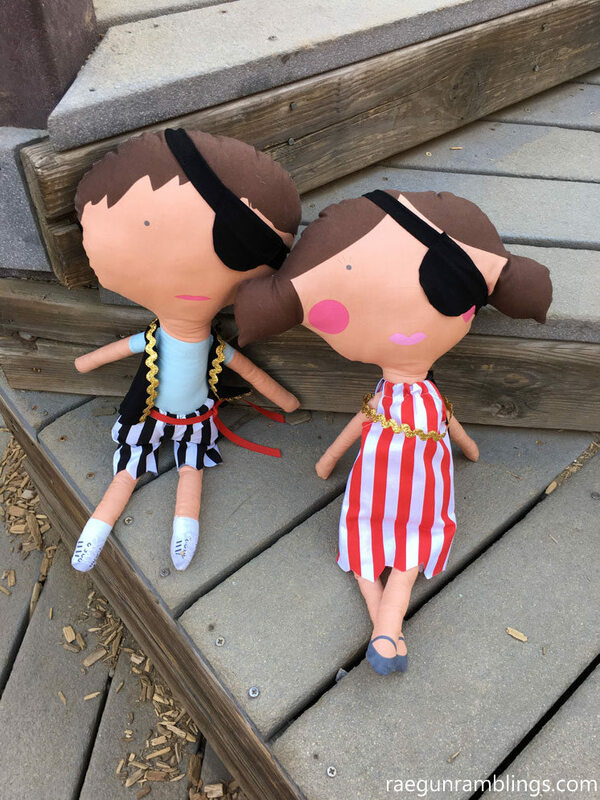 Use the same size eye patch as for the dolls. Measure your child’s head and subtract 2 inches for the band piece. Use the same width as for the dolls. 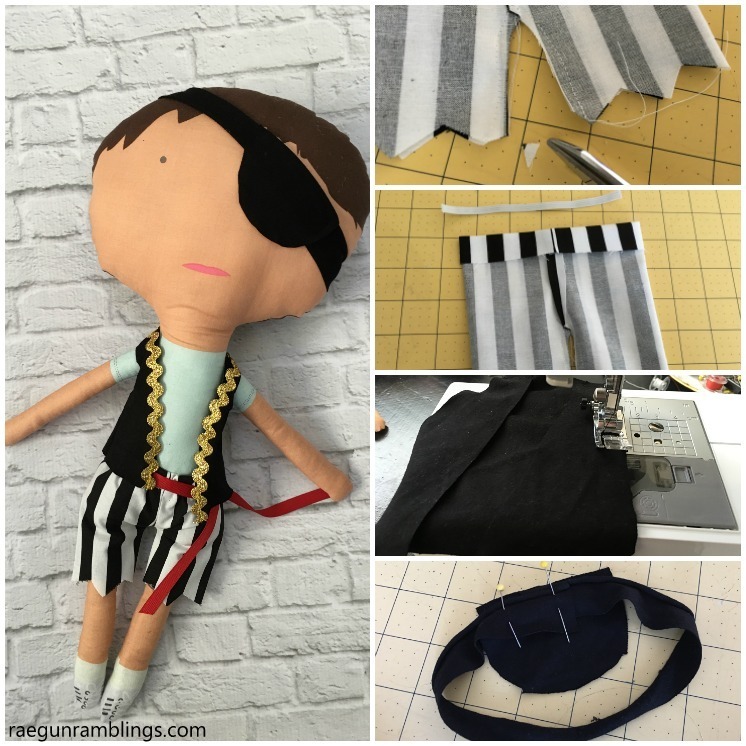 Assemble the eye patch just like the doll eye patches (steps 9-10). Teddy, my 2 year old, and I are totally smitten with these dolls. Like I’m already planning on getting more of this fabric and making other fun outfits for them smitten! They are just too cute. This tutorial originally appeared on the Riley Blake Designs blog.